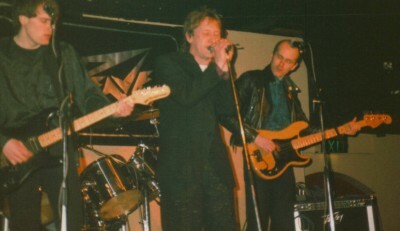 The Moochers playing at the "Band of the Year" contest at Cloud Nine in 1986. We came second to a band called "Well Said That Man" One of the group members auntie happened to be working behind the bar on the night of the competition. The contest ended in a "tie break" and surprise of surprises it was then hastily decided by the organisers to let an unassociated person, ie; a non fan/supporter of the bands to choose the winner and so the "auntie" was elected to cast the tie breaker vote. Guess who won that compo! They got to record a single as the 1st prize which didnt unduly bother us as we had just recorded our first single anyway. Our runners up prize was a video shoot performing............read,....... miming to our new single..........so it was a minor victory in a way as we already had a record out. The winners also (temporarily) helped themselves to two of our guitars immediately after the gig and upon being forcibly apprehended by several Moochers fans when leaving the venue they returned the guitars claiming that their roadcrew thought the instruments were theirs lol! Honoury mention; Steve Tabin, guitar virtuoso, genius and all round good guy and an inspiration to all of us. I was there. It was there I realised how tactical voting can go badly wrong. The moochers should have won, but well said that man shouldn't have even been a runner up. I got my car stuck in a very small alley way near the club, crumpled it up, was ford cortina that looked like a concertina when we finally got it out. I knew I'd seen a car go down there, but only remembered that it was a mini when it was too late. It was a great night. Hi Camper1,many thanks for your recollections. Its even better to get someone else`s memory of the evening to add colour and opinion. It was great fun to be involved in the competition even though it wasn`t that well organised. I remember lots of good bands all bringing their support and a fun night was had by all. Sorry to hear about your Cortina getting wrecked, were you in one of the bands? I hope your motor wasnt that well loved as it would have took the shine off the evening had it been mine? I remember one band who were a three piece who were technically brilliant with an Ace bass player who did all that "slapping on" Mark King type playing (never liked Level 42 tho! )and they were the best band for me............thought they were great so it was a shame that no proper judging panel was set up instead of who had the most fans.